CANTON, Mass. (January 10, 2013) – Baskin-Robbins, the world’s largest chain of ice cream specialty shops, has selected the top 10 finalists of its third annual Create Baskin’s Next Favorite Flavor Contest. Baskin-Robbins now calls on ice cream lovers across the country to vote for their favorite selection. The winning flavor will have the chance to be featured nationwide as a Baskin-Robbins Flavor of the Month in 2013. From November 1 through November 30, ice cream enthusiasts had the opportunity to become digital dessert chefs by virtually mixing their own ingredients to create a new ice cream flavor. Thousands of consumers chose from dozens of base flavors, a range of delicious ribbons like fudge crackle and strawberry, and a variety of mix-ins such as cake pieces and confetti sprinkles to make their signature ice cream flavor. 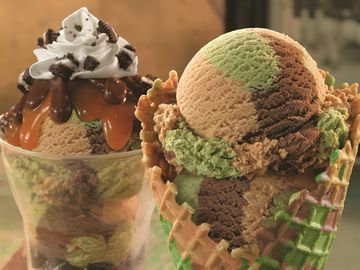 New ingredients for this year’s contest included Salty Caramel, Milk Chocolate and Peanut Butter ice creams, Passion Fruit, Triple Berry and Salty Caramel ribbons, and Pecans and Blondie Brownie Bites for mix-ins. Blondie Ambition, David O., Cayce, SC: Cream cheese ice cream with a caramel cinnamon ribbon, Heath Bar pieces and blondie brownie pieces. Caramel Cashew Cheesecake, Jodi W., Racine, WI: Cheesecake ice cream with a salty caramel ribbon, cashews and chocolate chips. French Silk Pie, Julie R., Chesterland, OH: Chocolate ice cream with a salty caramel ribbon, pie crust pieces and chocolate chips. Give Me a BR-AKE, Akta S., Chicago, IL: Cake batter ice cream with a dark fudge ribbon, cookie dough pieces and fudge brownie pieces. Hunky D'Oreo, Liz D., Eastchester, NY: Chocolate fudge ice cream with a whipped cream ribbon, OREO® cookie pieces and cookie dough pieces. Mom’s Secret Stash, Sue S., Glendale Heights, IL: Milk chocolate ice cream with a caramel ribbon, cheesecake pieces and pecans. Peppermint Bark, Joyce P., Westwood, NJ: White mousse with a dark fudge ribbon, peppermint candy and chocolate flakes. Thank You Troops, Heather G., Herriman, UT: Vanilla ice cream with a blueberry ribbon, cherries and strawberries. Tickle Me Pink, Sandi W., West Bend, WI: Raspberry ice cream with a confetti ribbon, golden cake pieces and confetti sprinkles. White Raspberry Tuxedo, Justin P., Ocean Springs, MS: White mousse with a black raspberry ribbon, cheesecake pieces and walnuts. Each finalist in the contest will receive free ice cream for a year. In addition to receiving a Flavor of the Month honor, the grand prize winner will receive a trip for two to Los Angeles which includes a three-night stay at a landmark Los Angeles hotel, car rental, $1,000 in spending money and a trip to Baskin-Robbins’ West Coast training center. At the training center, the winner will meet members of the Baskin-Robbins culinary team and spend a day bringing their virtual flavor to life. For more information about Baskin-Robbins and its Create Baskin’s Next Favorite Flavor Contest, visit www.BaskinRobbins.com or follow us on Facebook (www.facebook.com/BaskinRobbins) or on Twitter (www.twitter.com/BaskinRobbins).